Meow! Boarding an 1 hour 45 minutes flight has brought me to the land of Bumi Kenyalang, and this is my first day trip at Kuching. At the coastal area of Sarawak, seafood hunting is definitely a must-do. And we found this popular spot among locals and tourists alike, Muara Tebas Seafood (青山岩海鲜). After approximately 30 minutes drive from town, we arrive at the Muara Tebas fishing village which is famous for two things--- Fresh seafood and a 200-year-old chinese temple. Perched atop a hill 120-feet above sea level, Ching San Yen (古晋青山巖), or Green Hill Temple, overlooks a Malay kampung. Located directly opposite the temple is a row of seafood restaurants, and the best one is of course Muara Tebas Seafood Village. Here you can enjoy the best of both world--- Fresh seafood and affordable price. so you can expect the seafood to be prepared in traditional Chinese methods. Here you can enjoy the luxury of choosing live crustaceans, fishes, clams and lots more. 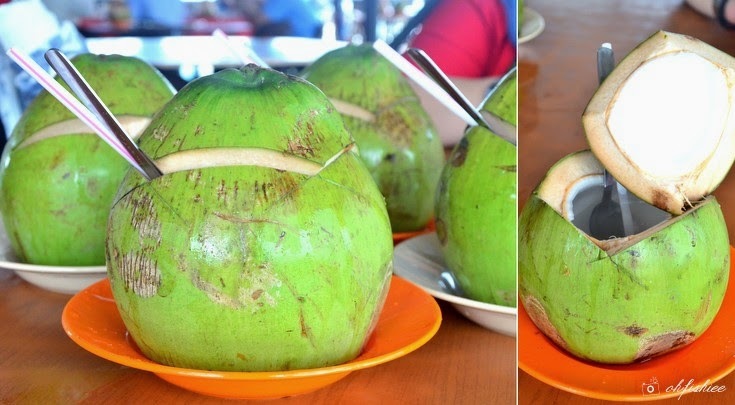 Unlike the mini coconuts we usually have during steamboat sessions, here the coconuts are freshly plucked from the tree, then cut and served to the customers for the best enjoyment by the sea. The biggest applause is saved for the delicious shrimps. Beautifully cooked to perfection, the steamed shrimps remain moist and succulent inside while giving a nice crunchy texture with a faint flavouring of spices. Love the beautiful texture, otherwise overcooked flesh becomes tough and chewy. The crispy exterior is complemented with soft and fresh interior of fish, with zesty sauce and pineapple cubes adding a refreshing twist to the fish. I enjoy every mouthful of the flaky flesh! Here is another special main dish that will keep the guests glued to their seats. Served piping hot in a claypot, the succulent clams lend strong oceanic sweetness to the gingery soup, allowing it to be equally flavourful and good. Tasty treat like oyster pancake is meant for sharing while we enjoy the rest of the main dishes. Every bit is quite delicious because of the combination of fresh oyster and a dip of sweet soy sauce, although it is a tad oily for me. Our seafood feast is also paired with some home-cooked favourites, such as the stir fried bittergourds with shredded carrots and egg. On its own, the bittergourd is sweet, the accompanying gravy is creamy, but together they are delicious and go well with steamed rice. We actually order the above 6 dishes for 4 of us and I have to admit that my stomach is filled to the brim! Overall, it is a lovely seafood meal at a wooden hut facing the sea. Pricewise, it is very pocket-friendly! With the same dishes, you probably can't get any cheaper than this in town. 1. Service is prompt and friendly. 2. Highly recommended place to visit if your wallet is tight and craving for high-quality seafood.